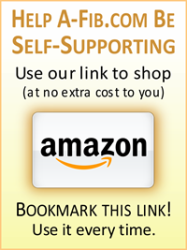 A-Fib, Inc. (A-Fib.com) is a 501(c)(3) nonprofit organization and the A-Fib patient’s independent source of unbiased information about Atrial Fibrillation and its resources and treatments (for more go to A-Fib, Inc profile on GuideStar). No Affliation and No Ads: To maintain our independence and unbiased viewpoint and integrity, A-Fib.com is deliberately not affiliated with any medical school, device manufacturer, pharmaceutical company, or medical practice. We accept no third-party advertising, do not charge for inclusion in our Directory of Doctors & Facilities and accept no fee (cash or other kind) for a listing in Steve’s Lists of Doctors by Specialty. 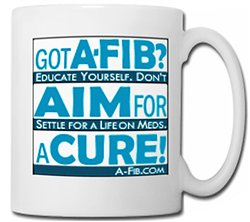 Our Mission: A-Fib.com offers hope and guidance to empower patients to find their A-Fib cure or best outcome. 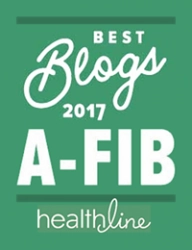 A-Fib.com is the patient’s unbiased source of well-researched information on current and emerging Atrial Fibrillation treatments. We are deeply indebted to the many cardiac electrophysiologists and surgeons who offer their counsel in publishing A-Fib.com. When I have a tough question, I can button hole them at a medical conference, send an email, or telephone them. While not always agreeing with all my positions, these doctors try to point me in the right direction. Read more about the Members of the A-Fib.com Advisory Board. Dr. Ryan had his first A‑Fib attack in the January 1997. After numerous failed drug therapies, two unsuccessful right atria ablations, and much frustration, he educated himself about Atrial Fibrillation through an exhaustive search of medical literature and interviews with medical experts. Steve Ryan observing ablation by Dr. Sidney Peykar, Cardiac Arrhythmia Inst. In April 1998 he was cured by Drs. Pierre Jaïs and Michel Haïssaguerre of the French Bordeaux group (Hôpital Cardiologique du Haut-Lévêque, France) through a relatively new procedure at the time called Focal Point Catheter Ablation (now called “pulmonary vein Isolation”). So grateful for his cure, he pledged to help other A‑Fib patients find their cure, too. 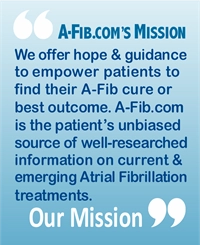 In 2002, he started Atrial Fibrillation: Resources for Patients (www.A‑Fib.com) a source of well-researched, unbiased information on current and emerging treatments, resources and medical research―all written in plain language for patients and their families. Every month tens of thousands of A-Fib patients and their families visit A-Fib.com seeking hope and guidance. Healthcare professionals around the world refer their patients to www.A-Fib.com. Videos: We’ve edited several short videos (3-5 min.) from Steve’s most interesting radio and TV interviews: Steve Ryan videos. 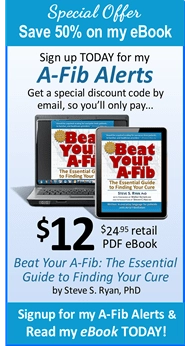 Also, visit our A-Fib.com Library of instructional videos and animations. Dr. Steve Ryan earned a Ph.D. in Educational Communications from the Ohio State University, and for many years taught film and television courses at the college level. He “jumped the fence” in 1983 to work in broadcast television production at ABC-TV in Hollywood and later for many years at NBC-TV in Burbank. For fun Steve trains for and runs sprint races and an occasional 5K race. He is quite the film buff and has seen every notable film ever made (well almost). He took an early retirement from NBC in 2001. Steve Ryan is ‘The A-Fib Coach’: If you have an urgent question or an important treatment decision to make, consider a one-on-one phone consultation with Steve S. Ryan, PhD. Read more about The A-Fib Coach. 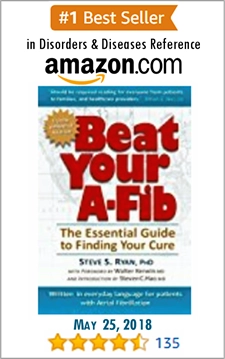 The story goes that when Steve Ryan started planning his website for A-Fib patients (A-Fib.com), the top priority was presenting up-to-date medical and research information but in layman’s terms, not medicalese. That’s where Patti Ryan enters the picture. With a background in corporate communications, she pledged to fight tooth ‘n nail, if needed, to represent the patients’ point-of-view and drum out as much medical jargon as possible. And, yes, there were many heated “discussions.” Patti also contributes her graphics and photography savvy to both A-Fib.com and and the publishing of the book, Beat Your A-Fib: The Essential Guide to Finding Your Cure (BeatYourA-Fib.com). Patti has earned a B.F.A. in Fine Art, a M.S. in Communications, and university certificates in business management and corporate training. Her professional experience ranges from graphic design and digital photography to corporate video production, and business management. In the past few years she has focused on creative project design and writing for the craft and home décor magazine/book publication markets.